A question that strikes me as I write this is: what would it mean to be a German landscapist in the 21st century? On the face of it, the answer is simple: it would entail being German and making landscapes. On both counts, Daniel Gustav Cramer scores well. Born in Neuss, near Bonn, in 1975 and working largely in Berlin, Cramer's national credentials are impeccable. On top of that, his exhibited work has been given over to images of woods, mountains and the sea. If there is a better claimant to the title of German landscapist, it is difficult to think who it might be. But the question is harder than that. First, "German landscapist" isn't a coincidental term involving an accident of birth and choice of subject. To practise as one would be to sign up to a tradition with roots going back to that other three–named artist, Caspar David Friedrich. Second, to be a German landscapist would be to make German landscapes, with a narrative closely tied to place. On both these counts, Cramer scores less well. 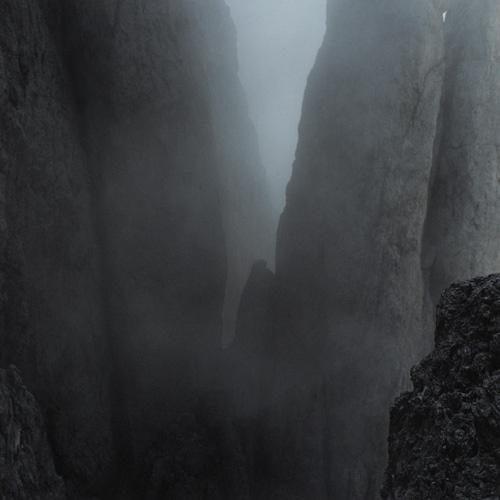 The curious truth about his pictures is that they are neither landscapes nor German. This seems a perverse thing to say, since his work actively invites both of those readings. What could be more traditional than a Friedrich–ish wood, its snowbound solitude a metaphor for the soul of Young Werther? If images of seas and mountains are not landscapes, then what are they? These questions are as central to Cramer's work as the one that opens this text. There is a vogue just now in contemporary art for what might loosely be called Neo–Romanticism, and these woodlands and seascapes seem to buy into it freely. Yet Cramer's images invite us – no, compel us – to read them as Romantic only to point out that this is precisely what they are not. Here is an easy way to approach us, they say: we are landscapes, Friedrich-ish, traditional. And yet they are they none of those things, nor are they prone to easy answers. Perhaps the most useful way of looking at Cramer's pictures is, in fact, as abstracts – a deeply perverse thing to say, given that they offer so much information, so many ways of reading. One is as a photographic equivalent of Action Painting, where the work's making becomes its own subject. I am looking at an image of path of ground elder, which required Cramer to sit in a rain-soaked wood for weeks until the precise moment of light and colour he'd been waiting for arrived. This hardship pales beside those of his mountain shots, which involved long exposures in barren places. And these in turn seem cushy next to his seascapes, made underwater rather than on top of it, in poor light and buffeting currents. Yet Cramer insists that these are not "extreme sports photographs", that, on the contrary, the story of their making has nothing to do with what they are; that the image itself is prime, and just happened to be found on the top of a mountain or the bottom of the sea. Equally, given their propensity to be read as landscapes, one imagines Cramer's photographs to be descriptive, locative and German. And yet this rain–soaked wood was in Scotland, that sea floor off the coast of Cyprus, this mountain in California. Morandis as bottles on a shelf, we wouldn't see that the last thing they are is shelves of bottles. Unless we recognise in Cramer's photographs all the things they might be, we can not begin to see what they are. You might say this was true of photography itself. Cameras may not lie, but photography informs by withholding information; or, if you prefer, by lying. In three dimensions, in real life, the eye works differently. As our gaze travels into a wood, it records infinite degrees of truth, of facts more or less revealed by light and distance. In the flattened perspective of a photograph, the world divides in two: the lit and the unlit, the hidden and the seen. The unvaryingly deep perspective of Cramer's woodland shots invites us in even as their patchwork surface – light and dark, insistently flat – repels us. His work finds the photographic equivalent of sculptural contrapposto, a moment of balance that would be lost if it moved an inch either way. A touch more narrative, mehr Licht, a hint of the author and we would be looking at Neo–Romantic landscapes. A touch less and we would be faced with a bucolic Neo-Geo, the natural world resolved into abstraction. And as with photography, so with Cramer. For the white branches of his woods to read as white branches, they have to be seen against darkness. There is no truth without the withholding of truth, no revelation without obscurity. All this is to suggest that we should approach Daniel Gustav Cramer as a formalist, although that isn't quite right either. His body of work does have a subject, and that subject is photography. As I have said, his images tease us by offering, always and at once, a pair of equally plausible choices: abstraction or representation, depth or flatness, a human author or a mechanical one. Behind all these answers lies a question: were these images made by a man or a camera? And there are new doubts, too, born in an era of visual manipulation. I'm holding Cramer's shot of snow-dusted mountains, a picture that looks oddly like Friedrich's Sea of Ice. it strikes me that we have no way of knowing whether his crags are real. They could be modelled or copied, or they could be a metre tall and shot in close–up. For all their clinical particularity, they could be computer–generated. That philosophical crisis of faith lies at the heart of 21st century photography, separates it from the hundred and fifty years of practice that went before. And that same doubt makes Daniel Gustav Cramer a very modern photographer. For all their studied sameness, each of his images is entirely different from the others. All are shot head–on, four square, receding into depth. They ask us to see them as alike, identical. And yet each image will have been made under different conditions, more or less slowly, have called for a greater or lesser degree of effort on the artist's part, have been taken at the archetypal extremes of human existence: on the tops of mountains, the bottoms of seas, the depths of woods. They are paradoxical things, landscapes without a land, abstract representations. They are full of stories and have no stories at all, revel in telling us that they have nothing to tell.